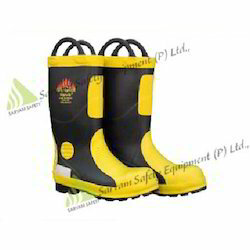 Widely praised for its quality, our enterprise is engaged in offering a vast range of Fire Fighting Boots. Our vendors' manufacture these boots by making use of high grade basic material and cutting edge techniques with utmost care. Our boots are strictly tested by our quality controllers against various parameters. The offered boots are specially made for workers safety during their working hours. Furthermore, these boots are praised for their perfect finish and durability. Looking for Fire Fighting Boots ?